Looking for some early deals on Chrismtas gifts? 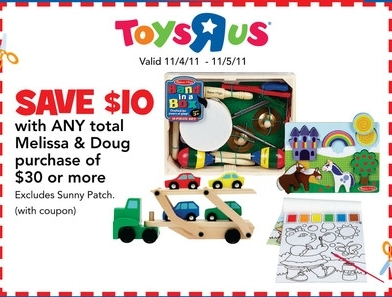 Toys R Us has some good deals going on this weekend that you may want to check out! First, they are hosting a Holiday Party this Saturday, 11/5 from 12-3 PM. They will have Crayola Crayons, 24 pk., for 25¢ and plush book sets for $5.99. Also, don’t forget to get the $10 off $30 Melissa & Doug toys found in the Toys R Us weekly ad.